When you’re focused on saving your pennies (like I am) it might be difficult to fit a vacation into your budget. Luckily, there are travel + adventure themed movies to transport you to another place. 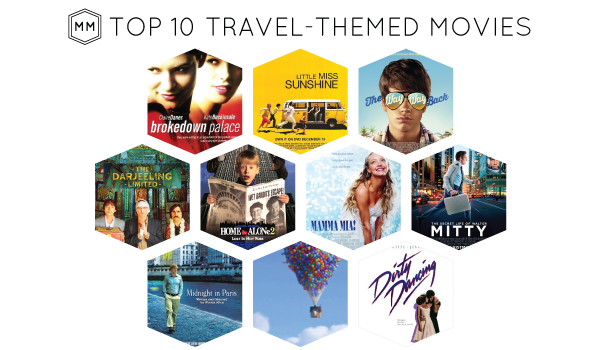 Below are my top 10 travel movies – did I miss your favorites? Thailand seems like a beautiful country with rich history and phenomenal architecture. Just don’t make friends with cute boys who traffic drugs. While more of a cautionary tile/episode of ‘Locked Up Abroad’, I’ve always counted this as one of my favorite travel movies. Olive Hoover has the kind of “I’m me, take it or leave it” attitude at age 7 that I wish I had at age 30. This wacky family adventure reminds me of goofy road trips we’d take with extended family as a kid (but thank goodness we never had to sit through a baby beauty pageant). This sweet coming-of-age movie had me wishing my family had a summer rental house near the beach. Wes Anderson has a signature style that makes me want to jump in each of his movies and live there for a while – especially that gorgeous pink Grand Budapest Hotel. In ‘The Darjeeling Limited’ three brothers take a journey on a train (how glamorous!) through India (how magical!) and reconnect with each other along the way. I truly believe my love affair with New York City at Christmastime began the moment I saw this movie for the first time. Plus, it introduced me to the Talkboy, which provided hours of entertainment for my sisters and me. The white, sandy beaches of a Greece provide the backdrop for some hilarious fun leading up to beautiful beach wedding. Bonus points for being a musical (based on one of my favorite Broadway shows!). This film, based on James Thurber’s short story, made me want to do something crazy and adventurous. We settled for some fro yo after catching the show at our local theater… but in the spirit of Walter Mitty, I imagined we were ordering gelato from a tiny Italian gelateria. There is no greater adventure than love. BUT traveling by balloon house to a far-off, exotic world where you meet talking dogs and interesting wildlife seems like a pretty fun adventure, too. How fun would it be to take a family vacation to an outdated, stuffy, preppy, country club? Probably not so much, unless a Patrick Swayze lookalike happened to work there. A girl can dream, right? For die-hard fans, you can have your own weekend getaway at Kellerman’s (aka Mountain Lake Resort)!